In the aftermath of war, over 1 million Cambodian refugees fled with their families to rebuild their lives in other countries. From near artistic annihilation, the cultural arts of Cambodia were valiantly recovered and preserved by Cambodians inside and outside of the country thus leading to a unique contemporary intersection. For twenty-first century Cambodians, art has begun to question and engage the present. Recognizing the critical global and local contributions of Cambodian diaspora artists, this roundtable discussion features an intergenerational group of visual and performing artists to share their experiences and ideas. Panelists will address issues of transnational identities and the ways in which the act of returning “home” functions as an important point of encounter or departure for their artistic practices. Curated and moderated by Anida Yoeu Ali, this panel will feature dancer/choreographer Prumsodun Ok, photographer Pete Pin, conceptual artist Amy Lee Sanford, and visual artist/scholar LinDa Saphan. This entry was posted in Talk/Panel and tagged A/P/A Institute, Art, Cambodia, Cambodian Living Arts, Diaspora, Legacy of Now, NYU, Seasons of Cambodia on April 18, 2013 by achang. 1975: Group Exhibition of Diasporic Cambodian Art — Kickstarter campaign! What is this fundraiser for? An exhibition titled 1975, featuring works by Anida Yoeu Ali, Amy Lee Sanford, and LinDa Saphan, and curated by Chuong-Dai Vo. This exhibition brings together three diasporic Cambodian, woman artists whose works exemplify the dynamic contemporary art scene in Phnom Penh: Anida Yoeu Ali’s photographs and video installation recall life in a refugee camp following the fall of the Khmer Rouge; Amy Lee Sanford’s video and prints share with viewers the process of uncovering a difficult history, the turmoil of the late 1960s and 1970s, as told in letters written by a father she never knew; and LinDa Saphan’s drawings of apartment buildings and architectural monuments in current-day Phnom Penh take us back to her mother’s memories of living there. Why is this exhibition important? The Khmer Rouge regime killed 1.7 million people and left another one million as refugees; 90% of the country’s artists were killed or were forced to flee. In the last three decades, a new generation of artists has been rebuilding the country and creating a new cultural scene. This exhibition is planned to coincide with Season of Cambodia, an unprecedented initiative bringing more than 125 Cambodian artists to New York City, to highlight the post-1979 rebirth of the arts in the Southeast Asian country. This exhibition, 1975, is historically significant because it is the only visual art event that foregrounds the contributions of woman artists and diasporic Cambodian artists to the construction of a post-war and post-genocide society. Although the dates for the exhibition coincide with the Season of Cambodia festival, the exhibition is independently organized and funded. There are few exhibitions of contemporary Cambodian art in the world in general, and in the U.S. in particular. Your contribution will help us make this exhibition happen! Who are the artists in the exhibition? Anida Yoeu Ali is an artist and scholar whose works span performance, installation, video, poetry, public encounters, and political agitation. Utilizing an interdisciplinary approach to artmaking, her installation and performance works investigate the artistic, spiritual and political collisions of a hybrid transnational identity. She is a collaborative partner with Studio Revolt, an independent artist-run media lab in Phnom Penh, Cambodia, where she currently resides. For further details about her work and process, visit www.studio-revolt.com. Amy Lee Sanford is a Cambodian American visual artist who works cross media, from drawing and sculpture to performance and video. Her art addresses the evolution of emotional stagnation, and the lasting psychological effects of war, including aspects of guilt, loss, alienation, and displacement. She was born in Phnom Penh during the Lon Nol government of the early 1970s; her father, an intellectual, sent her out of the country with his American wife nine months before the Khmer Rouge took over the country. Currently, she is an artist-in-residence with the Lower Manhattan Cultural Council, through the Season of Cambodia events taking place in New York. Her work can be seen at www.amyleesanford.com. LinDa Saphan was born in Phnom Penh, Cambodia. Fleeing the Khmer Rouge regime, she and her family lived for more than two decades in Canada and France. In 2005, Saphan co-organized Visual Arts Open, a landmark contemporary art festival that introduced Cambodian artists to the international art market. Recognizing a lack of resources to support women artists in Cambodia, she established the “Selapak Neari” program the same year, providing workshops, networking opportunities, and an exhibition space for emerging women artists. At the same time, she curated the first group exhibition at the Ministry of Fine Arts and Culture. Saphan earned a PhD in Social Anthropology from the Sorbonne in 2007. Her work can be seen atwww.saphan.info. Chuong-Dai Vo is an independent curator and writer based in NYC and a Visiting Scholar at MIT. Her curatorial and scholarly work focus on how war and diasporic migrations affect the production of literature, cinema and visual culture, in particular in the circuits between Asia and the U.S. She has received fellowships from the Mellon Foundation, the Fulbright Program and the University of California Pacific Rim Research Program, among others. Her most recent project was a co-curated group exhibition titled War is for the Living. This entry was posted in Exhibitions, fundraiser and tagged 1975, Amy Lee Sanford, Anida Yoeu Ali, Cambodian Art, Chuong-Dai Vo, Diaspora, exhibition, Kickstarter campaign, LinDa Saphan, New York, Queens, Topaz Arts on April 4, 2013 by achang. This entry was posted in Exhibitions, Film Screenings, Performance, Talk/Panel and tagged Anida Yoeu Ali, Generation Return, Post Genocide, Post-9/11, Spoken Word, Video Screenings on April 4, 2013 by achang. 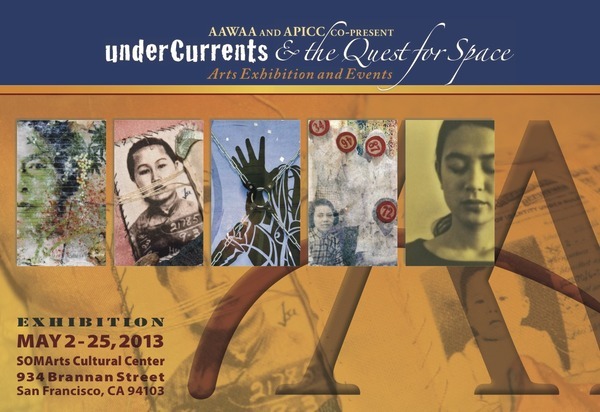 Asian American Women Artists Association (AAWAA) is a nonprofit arts organization dedicated to ensuring the visibility and documentation of Asian American women in the arts. Through exhibitions, publications, and educational programs, we offer thought-provoking perspectives that challenge societal assumptions and promote dialogue. This entry was posted in Art Fair, Exhibitions and tagged AAWAA, APICC, exhibition on April 4, 2013 by achang.